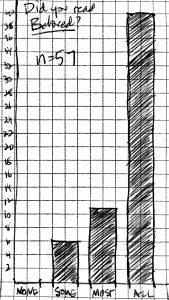 To the right is the grade distribution that describes how my students did last fall on the multiple choice exam over their summer reading books. What would you conclude if presented with that set of data from your students: did they read the books assigned for summer reading? 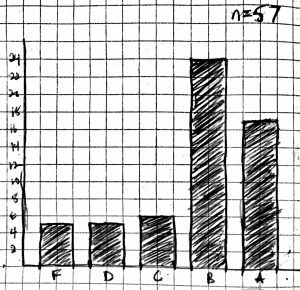 The grades seemed pretty strong–only 16 of them (28%) got fewer than 80% of the questions wrong. Given how notorious we ELA teachers are for writing difficult and specific questions over the books our students read, this appears to be pretty strong data suggesting that they did in fact read. Only 42% of students reported to have read all of both books assigned for summer reading. 51% said they read one (most often The Great Gatsby) and some or none of the other (most often Pride and Prejudice). Students wrote on a piece of paper how much of the assigned summer reading they completed and how carefully they read. I asked them for complete and total honesty because in order to teach them well, I needed to know exactly what I was dealing with. I assured them that there was no grade penalty whatsoever attached to what they said, so it would not hurt them to admit to not reading if that was the case. I discovered that only 41% of them had actually read both books. Over half of them had completed one book only (having read some or none of the second book). Two students completed neither book but read some of both of them. And two students read none of either of the assigned books. I saw a contradiction between what the multiple choice reading exam showed and what my students told me when I asked them. Had I based my assessment over whether or not they had done the summer reading solely on the exam, I would have been pretty confident that the vast majority of them had read both books. But the majority of them had NOT read both books. How did they still do so well on the exam? You know how. Sparknotes. Watching the movies. Shmoop. It’s actually pretty easy to do okay on a multiple choice exam over books you haven’t read as long as you consult enough of these kinds of sources. I know. I’ve done this. That’s how I survived AP English Literature myself as a high school senior. I read not even one of the assigned books and got a B in the class and a 5 on the exam. I’ve been teaching high school ELA for a couple of decades. I was not actually surprised by how few of my students had actually completed the summer reading assignment. 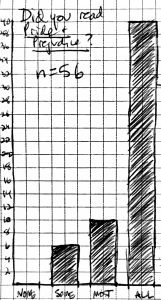 In fact, I surveyed a class of 30 students several years ago to get a sense of how much they read of what was assigned to them in school. Only ONE of the 30 students indicated that she had read every single book assigned in the previous year of school. Most students could not recall even one title of a book that had been assigned to them. I want my students to read. To ACTUALLY read. And I want them to read because we must read to make sense of our existence as human beings. So if my goal is that my students will actually read the books, I need different data to help me see if they are hitting that goal. The multiple choice reading test didn’t give me the information I need; there was no reason for me to continue this kind of accountability measure . 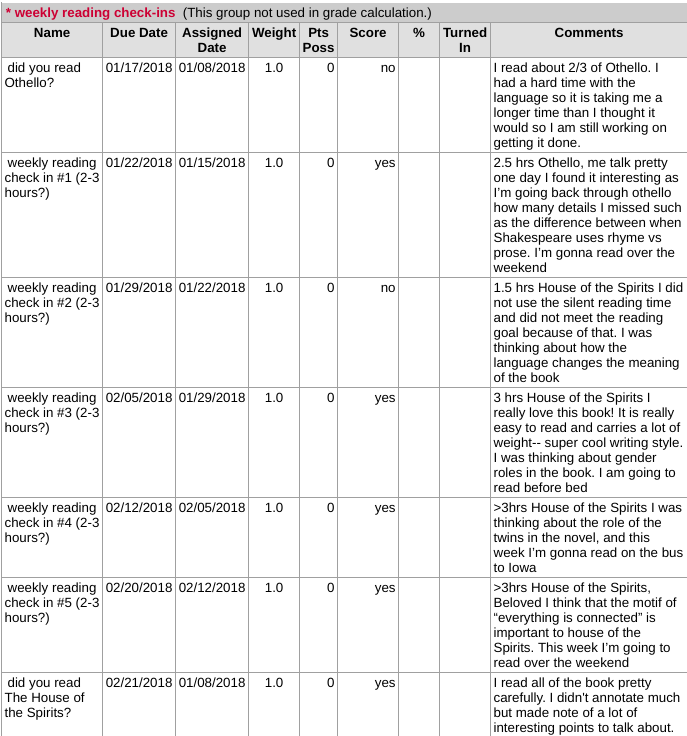 So as I did back in August, I asked students throughout the school year to tell me about the reading, with complete honesty, with no grade penalty at stake. On the date we were scheduled to begin conversation about each book, I gave each student a note card and asked for an honest report about whether or not they completed that book and how carefully they read it. I read their note cards, wrote a note back to them, put some data in the gradebook about what they said, and ask them to tape the card into their writer’s notebook so they could keep track of their reading over the course of the year. The first book we discussed together in class was Gatsby. According to student self-reports at the start of the year about their summer reading, most of them had read the book in its entirety. It was the book they had most likely read had they only read one of the two books. 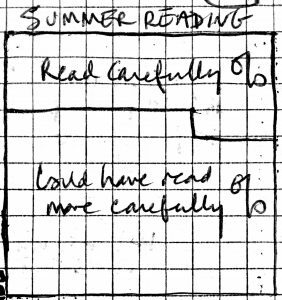 But the summer reading self-report data showed a different story for the second book we discussed in class together, Pride and Prejudice. Most of them had NOT read it. They had some time to read P&P if they hadn’t completed it over the summer while we were dealing with Gatsby. And by the time we started discussing P&P in class, 71% reported that they actually read it in its entirety. I was thrilled. 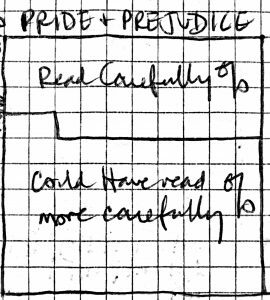 Only 6 of my students reported to have read only some of Pride and Prejudice. 71% of students reported to have read all of Pride and Prejudice by the date we started discussing it in class. This included students who did not read it over the summer as assigned but read it in time for our work with it in class. 70% of students reported to have read all of Frankenstein by the date we started discussing it in class. 71% of students reported to have read Othello by the date we started discussing it in class. 70% of students reported to have read all of Beloved by the date we started discussing it in class. 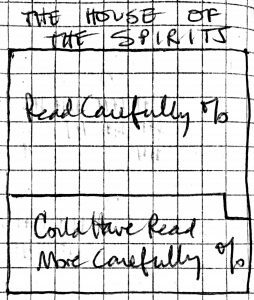 Pretty consistently, around 70% of my students said they read each book completely– except for The House of the Spirits. 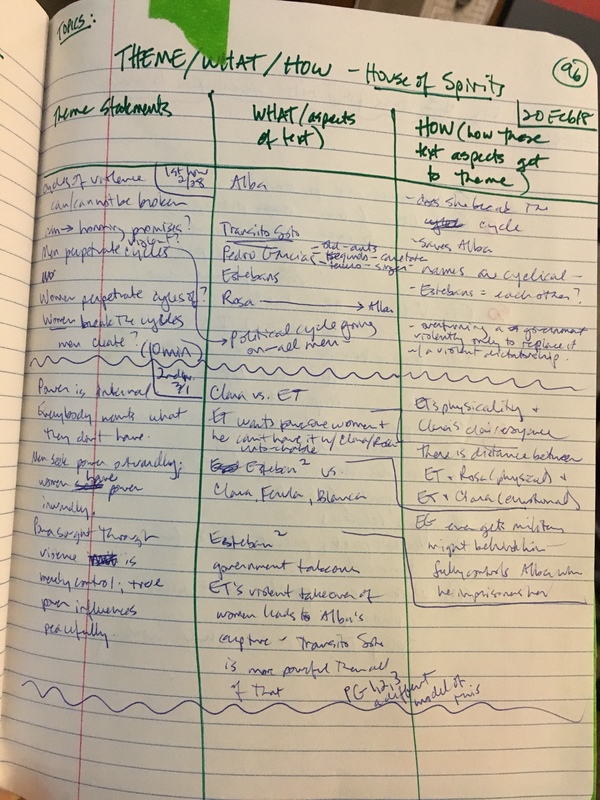 From talking with my students and reading what they wrote on their notecards to explain what got in the way of completing the book, I think the book’s length and complexity was an issue. Many students told me that they just didn’t give themselves enough time to read it or that it took more time than they thought it would. This will be helpful information to pass along to my students next year. It’s also important to note that it’s uncertain how the 10 or so absent students that day skewed the data. 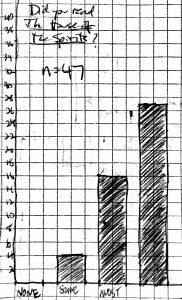 Another consistent data point was the number of students for each book who reported to have only read some of the book–4 to 6 students. I would have liked to see that number decrease, and I will work on that for next year. Only 32% of students said that they read the summer reading books carefully. Only 38% said they read Pride and Prejudice carefully. 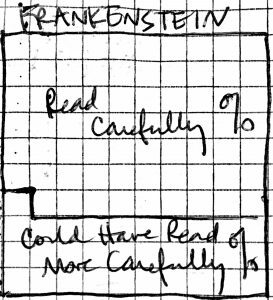 69% of students said that they read Frankenstein carefully. 52% of students said that what they read Othello carefully. 61% of students said that they read The House of the Spirits carefully. 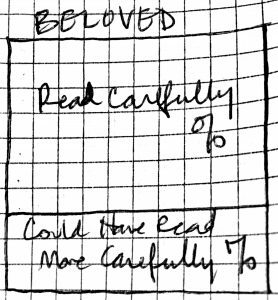 70% of students said that they read Beloved, carefully. I was glad to see the jump from how many students reported to have read carefully for the summer reading and for Pride and Prejudice to how many students said they read carefully for the remaining books. The slight dip on Othello I think is very likely connected to it being Shakespeare. It takes much more time and effort to read carefully, which some students admitted to not having done in their notecards to me due to the difficulty of the text. Several students told me that they started out reading very carefully but then just wanted to get it done. 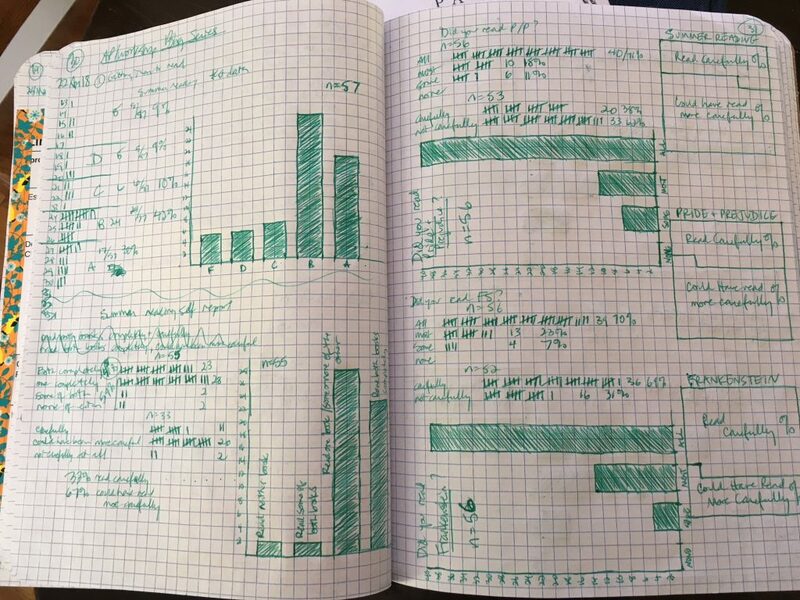 Thank you for hanging in there with all of my graphs here–by mistake, I purchased a writer’s notebook that had graph paper instead of lined paper and, well, it inspired the graphing. 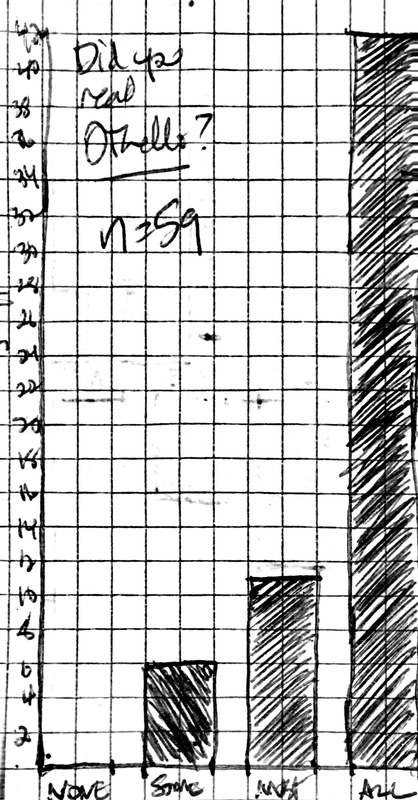 Putting my purchased-by-mistake graph paper writer’s notebook to good use. But the point here is this: traditional accountability measures like reading quizzes/tests fail to give us the data we need to really know how our students are doing as readers. If there are high stakes attached to these measures (grades), then students might do whatever it takes to get the grade that they want. Often this includes things that they do instead of reading. If they can still do fine on the traditional accountability measure with out reading, then why would they engage in the difficulty of reading the challenging literature that an AP Lit course asks of them? 1) Dedicate class time to reading. If reading is so important, then we need to spend class time doing it. Students will learn to value whatever it is that we teachers decide dedicate minutes in class to. Hence, my students have 30 minutes every Monday to read silently. I tell them that job #1 is reading the books assigned for class. Job #2 is reading other books of equal literary value (I provided to them the list of authors recommended by the College Board for AP Lit). Job #3 is reading anything they want. I have some ideas for next year to provide a bit more structure to the independent reading (a list of contemporary writers doing really incredible work like Jesmyn Ward, George Saunders, Mohsin Hamid, and Paul Beatty and some book clubs to help to cultivate some reading habits for life) (the Man Booker award winners and shortlist nominees has become a go-to for me in my own personal reading of late). The 30 minutes on Mondays for reading has become critically important in my classroom. Students know it’s their job to show up with a book to read. Many use this time to re-read sections of our assigned novels (which I love). I also invite them to use a few minutes of it to head to our school library to browse the fiction section as needed. I can monitor their reading and have some brief reading conferences. And I always try to sit down for at least a few minutes of it and read with them. It makes reading a thing we do together. Since I’m not using reading quizzes as accountability measures, I have re-purposed them into “reading comprehension checks.” These are google forms that I build as I’m reading the book myself. It’s multiple choice so I can set the google form as a quiz and the students can get immediate feedback on how they did with the questions. They can go through the form as many times as they want–it will let them know which answers they got wrong but won’t tell them the right answers (look here for screenshots of the necessary google form settings). In this way, working through the form becomes a learning experience–they can use it to check and hone their understanding of the text. I make it available as they are reading so they can check comprehension as they go, but I set a date for completion about a week or so after the book is due for class discussion. As an example, here’s my reading comprehension check for Beloved. It’s a difficult read on so many levels, but the constant movement between present and past in the book makes simple comprehension of what’s happening in the story a challenge. 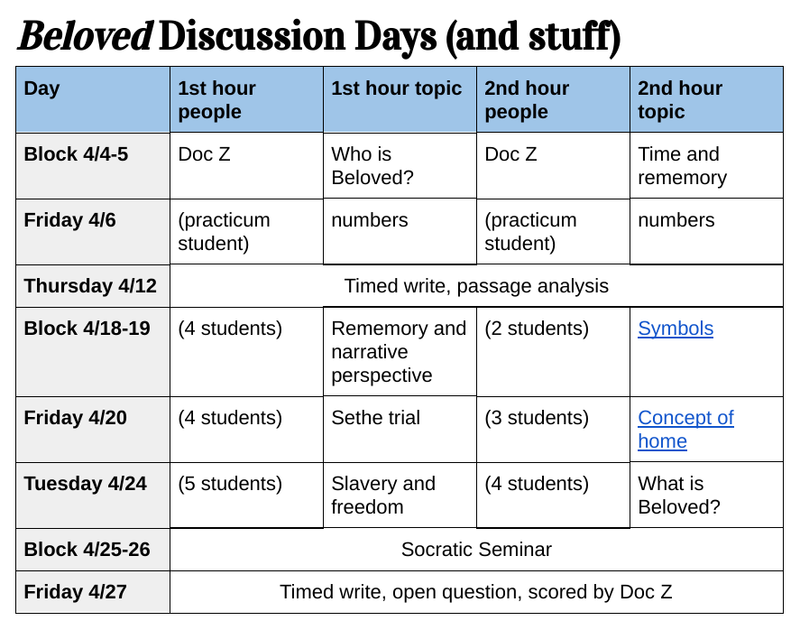 Of course we talk about the purpose of the interplay of past and present in the narrative once we get into our discussion of the text, but I designed the reading comprehension check to help the students to keep track of what happened–present vs. past–in each chapter. There’s a list of plot events for each chapter and their job is to check off which of them happened in the present timeline of the book. You’ll see at the start of the google form that I drew the plot events from an online source (Shmoop). I’m working to model for them responsible use of those kinds of resources–alongside a text rather than instead of reading the book. Especially with a tough book like Beloved, students might give up if they have no help to make sense of things. There are many tools at their disposal that they can use to assist a successful reading of a difficult piece of literature. 3) Use a variety of strategies to support students as they work toward deadlines for assigned reading. We don’t discuss or write about a book in class until the students have read it in its entirety. In a class like AP Lit, I have always wanted to have the entire text available for our work with it. Otherwise, it’s like trying to interpret a painting when you’ve only seen a little bit of it. I do know, however, that my students need some help along the way for a successful reading experience. I assign discussions in Google classroom (using the “question” feature). Students post a thought or question they have about the reading when we are maybe 2 weeks away from the due date for discussion and then read other students’ posts and choose one to respond to. This becomes an opportunity for me to monitor what they are thinking about the reading and jump in to offer some clarification where needed. And it’s a bit of encouragement to read. The weekly in-class reading time also helps here because I can check in with students if they’re struggling with the reading and offer some individualized instruction. I also launch the reading of each book with a short presentation–who wrote the book, what was going on in the world when the book was written, what the key elements of the text are, what might be difficult, some essential questions to consider as they read, etc. I spend no more than 20 minutes on this, but it lends some context and background to students for their reading and also is a very clear “hey, you need to start reading this book!” And of course having the reading comprehension checks available for students while they are reading can be an important support to them. So I’m not assigning ranges of chapters and working with students as they read, but I am offering some supports to them, suggestions about how to manage their time to hit the reading due dates for each book, and creating natural opportunities for me to monitor their reading along the way. 4) Be an active member of the reading community. I have to remember that I’m a critical member of our reading community. I re-read the books every time I teach them, and I tell students how it’s going–quick updates at the beginning of class, stories about my efforts to get through a book, etc. I also talk a lot with them about my own reading practice. Over the last several years, I’ve made concerted efforts to read more and to model that for my students. There’s a link in my email signature to my Goodreads account, and I also post that link on my Google Classroom pages so students can take a look at what I’ve read, what I’m reading, and what I plan to read. 5) Frequently collect meaningful data on their reading progress. 6) Do not attach any grades to students’ reading progress. The words you see in the last column are the student’s own. They are what she typed into the weekly reading check in google form. I did a simple copy/paste from the spreadsheet holding the google form data to the gradebook–this takes me about three minutes per class. 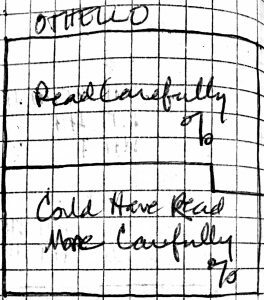 For very little time and effort on my part, I have an excellent qualitative data record on this student’s reading progress. I can use this to get insight into her life as a reader. And she was honest with me because she knows there was no grade penalty if she didn’t achieve the weekly reading goal. What do you do to invite your AP Lit students to read the required texts? One reason I go to NCTE every year is to listen. There are people I try to see every year, just to hear what they are thinking about and working on. Just to hear what they think the rest of us need to think about and work on. Ever since I first saw him at NCTE16, Cornelius Minor has become one of those people. Cornelius was the key note speaker at the CEL luncheon–my first time ever attending the conference after the conference. At the core of his talk was a call to action: support teachers to take on their own classroom-based action research that confronts the problems that plague their classrooms. He framed all of this with a larger conversation about systems that oppress our students, about how when we remain neutral in a stream we go with it, about how when we remain neutral in a system, we perpetuate it. About how it’s not enough to just say you’re against a system that oppresses–you have to actively disrupt it. He presented a lengthy list of places where oppression hides in schools, and grading wasn’t on the list, but it certainly belongs there. The grading system as we know it–points/grades for compliance and a constantly updating, high stakes grade in the electronic gradebook–fails to empower students to own their learning and growth. It’s a power system where the one who awards the points and grades has all the power and students are left scrambling to collect as many points as they can. What our students need to be doing instead is honing their skills as readers and writers. Ours is a complex world to read. They need to be able read that complexity if they’ll be able to write their own futures within it. Cornelius reminded us that what we teach–literacy–at its center is not an academic pursuit. It’s a socio-political one. Literacy sits at the core of democracy. Teaching literacy is a radical concept, he explained, and denying literacy of any human is one of the most vicious forms of oppression that there is. My no-grades journey has always been about empowering students. It’s always been about creating a classroom where they own the learning rather than waiting for the numbers I put in the gradebook to tell them if they’ve learned anything or not. 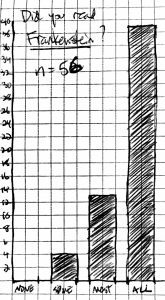 When it was about the number, the points, the grade, that is all my students looked at rather than the critically important learning they need to do. When I’ve said in the past “stop grading,” it doesn’t really capture the work we need to do. In most cases, we can’t stop grading. I can’t. I still have to get to semester grades. But there’s nothing that says I can’t get there in ways that will lead to more empowerment for my students. I can disrupt the grading that is expected of me. THAT is what I’ve been up to for the last four years, even though along the way I didn’t quite have the right term to capture it. So let’s disrupt grading. The blog series I wrote last fall is about that. I’m hoping to turn it into a book–that’s been my focus of late, and it’s the main reason this blog hasn’t gotten as much attention as it should. Best of luck fellow teacher friends out there with the end of the semester. At my school, we have one more week for finals. I’m buried in semester grade letters–but the stories my students are telling me about their journeys as readers and writers this semester are inspiring. I’m loving every moment of it. We can make grading a route to empowerment. We can make the semester grade an opportunity for reflection over and celebration of our students’ learning. I had a great time at NCTE. I saw old friends, made new friends, and we got Tracey to blog!!!! That’s a lot of wins. And I like wins. But my theme for this conference is authenticity, which means being real. And the real is I also heard some tough stuff at this conference. We were talking at dinner on Friday and someone I really respect (Stevi Quate- check her out, she’s awesome) challenged me to really think through how I would encourage and advise a fellow teacher to start changing things in the classroom in the way that we’ve been advocating. I like being challenged and pushed and it was a fair call, especially knowing how hard it is to enact change under even the best of circumstances. In our presentation on Saturday many teachers asked about how to do the things we do when there is either subtle or overt resistance to change in departments, schools and districts, and from colleagues, administrators, and communities. Those are serious questions that we are trying to answer (here’s one take from a while back- it’s hardly complete, but it’s a start). At dinner I finally got the full story about a teacher who nearly lost a job because of what they posted online. It’s a long and interesting story, and I encouraged that teacher to write about it, because it’s a story that needs to be told. Last night we went to Fountains of the Muse (holy crap people, why didn’t someone tell us about this, and why aren’t you ALL there. Never mind, next year I’m making you go). We got talking, near the end, about the challenge of being who we really are as teachers and people (I’m a musician, and I think that raised some questions, since I’m also a teacher). Several folks shared about the fear they feel around revealing parts of themselves as teachers. We shared a bit about our fears about blogging when we first started- and we did have fears. And we are judged, and shamed, and silenced. Often. In our departments, in our schools, in our districts, and in our state and national politics. That is the real. That is one of our truths. And we need to speak that truth. Here’s another truth. There are a lot of us. Together we have a big voice. A really big voice. 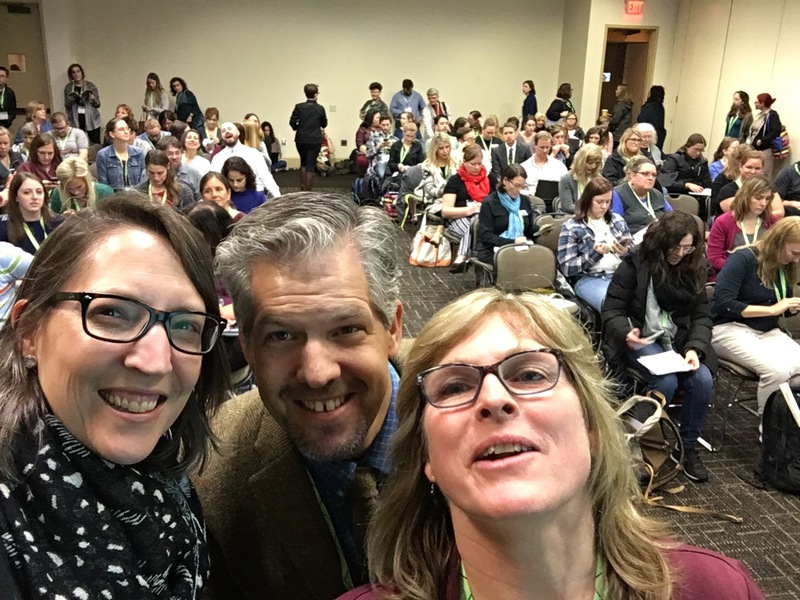 NCTE is a way to connect with others, to amplify our voice. Find other ways. Make friends and allies. In your school. Your neighborhood. Your union. Your local politics. Your state association. Twitter (yes, it’s a cesspool, but it’s also a great way to connect). However you do it, find your people, find your voice, be heard. We need all of us to join in here. Even you. Yes, I am finally joining the Paper Graders as an official member! Mrs. B is here! 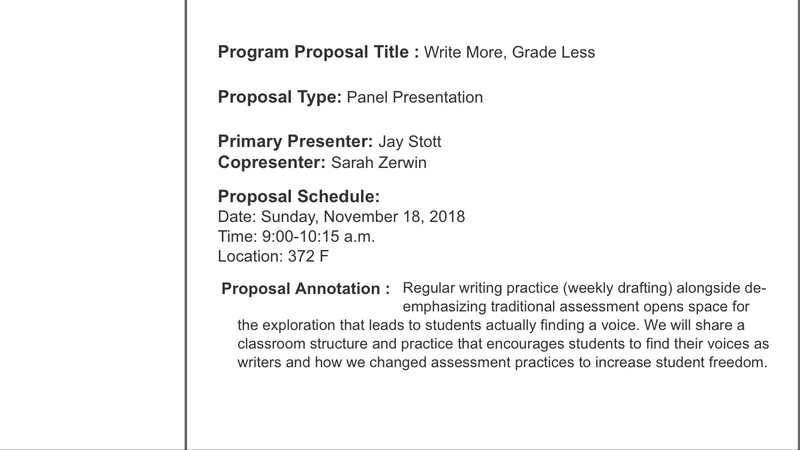 We had an amazing day at NCTE today, including a presentation entitled Stop Grading: Empower Your Students to Evaluate Their Own Learning to over 200 people in a not-quite-big-enough room at the St. Louis Convention Center. Sarah and Jay spoke about how they are teaching students to take ownership of their own learning by creating their own learning goals, becoming better at reading their own writing and finding flaws in their drafts which they can correct. I shared how my IB students practice for their Oral Exams by pairing up and sitting across from each other with one person as the speaker and one as the listener, and while the speaker delivers his or her commentary on a poem or soliloquy or piece of prose, the listener listens, very carefully, and takes copious notes on the commentary being given by their partner. The exercise is one to prepare them for their Oral Exam in January, since there is no way for me to sit with each of my 90 IB students and listen to a 10-minute commentary. They are learning how to listen carefully, take notes carefully, present a commentary in a compelling way, and then give feedback to their partner that will help them improve in their next attempt at an oral commentary. The point being that I am trying to teach my IB students who are getting ready to head off to college, work, the military or world travel how to speak clearly, listen carefully, and help another human being improve their efforts at speaking and listening. These are skills that will help them in college, in jobs, in life, and they are also learning how to be more independent from me, the teacher, and help each other without my interference. In the end, these practice sessions help me as much as they help them, because I don’t need to be listening to every word of 90 students, but can listen in and offer a helping hand when needed. My day started with a wonderful walk with Sarah Zerwin down by the riverside as we ventured early this morning to the Saint Louis Archway Park and surveyed the Arch itself, along with the park around the Arch, the trails leading down to the river, and the life of St. Louis on an early Saturday morning. We saw a river barge going by, just as it would have many years ago, we saw the sun come out from behind the clouds to light up the Arch, we saw an amazing bronze statue of Lewis and Clark returning from their long exploration to the Pacific Ocean, and we saw a beautiful little cobblestoned section of St. Louis called Laclede’s Landing, St. Louis’ oldest district. The sad part of our journey was that we saw a few runners and Park rangers, but not many other people, a common theme in our few days here in the city that has served as the Gateway to the West. Jay noticed that there seems to be an emptiness in St. Louis, as if the life of the city has been punched out in the last few years. We heard some poetry shared by Noana, a young teacher at tonight’s Fountain of the Muse session after all the other NCTE participants had gone home, that backed up what we were feeling. She lives here, and she wrote a beautiful poem about St Louis, about the old buildings that seem to have black eyes from the blown-out windows, and the empty streets, and she told us that St. Louis has always wanted to be a big city, but is still and ever was a small town. My first conference activity this morning was going to hear Sara Ahmed, Harvey “Smokey” Daniels, and Stephanie Harvey speak on Igniting Kids’ Curiosity and Passion with Student-Directed Inquiry Circles. My favorite part was Sara’s section on Soft Starts, where the elementary and middle schools they work with have a 5-15 minute “soft start” to the day where they come into the classroom, find a book or newspaper or magazine, find a comfortable beanbag chair or place on the floor, and read for a few minutes before they begin class. Another version of this soft start that Smokey Daniels presented was a middle school in Kentucky that has kids waiting at the door to come in and choose to do a dance party or reading or work on hands-on projects for a few minutes before the day of learning begins. 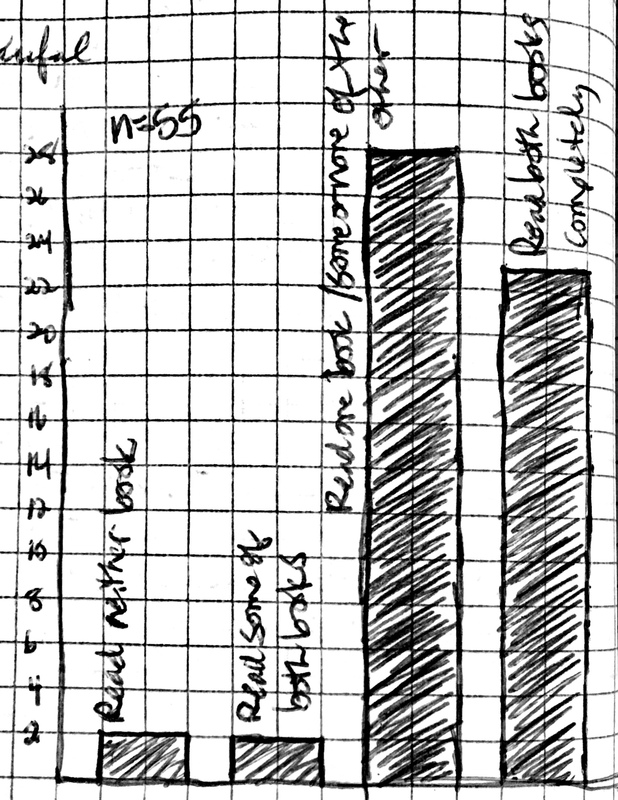 The end product in all of these experiments was a group of students who were more settled, more relaxed, and more ready to learn. I thought about how I practice a “soft start” with my high school classes by asking them to pause each morning for 3-5 minutes to do a mindfulness exercise. Sometimes we just focus on breathing, sometimes we do morning sun salutations outside facing the sun or the Flatirons, and sometimes we lie down on the floor, put our feet on the chairs in astronaut position and just take a few minutes to calm our minds and bodies. The result for my students is that they can then come to the work of the day in a more relaxed and more focused mood, and they are able to get more work done in less time, because they have a clear mind and a more relaxed body to get into whatever we are working on that day. For lunch, I was fortunate to go to the Secondary Section Luncheon where Daniel Jose Older, who has a new YA book called Shadowshaper out, spoke to us about the value of teachers in supporting and encouraging young writers to become committed writers of the future. He said “Teachers are magic, and magic is dangerous!” and he spoke about how his mother, who was a teacher, encouraged him in his writing and creativity, as did his teacher in middle school, who gave him a book entitled Bloodchild by Octavia Butler. He didn’t read it or really understand it until 10 years later, but when he did, it became one of his inspirations for writing his own work. He said he did not see himself in books because he was a young boy of Cuban descent in New York, and he said most books he read in school did not contain black or brown characters unless they were being saved by white men. He asked us “How do you survive the long night of invisibility when you love a genre that doesn’t love you back?” Great question, and one that he is trying to answer by writing YA books that feature young characters of color who are powerful in their own right. Daniel ended his talk with the statement that “Literature’s job is not to protect young people from the ugly world around them, it is to arm them with language to describe what they already know.” Powerful words from a powerful writer. So what did I learn today? I learned that the best way to get to know a place is by getting outside and walking in the streets and parks and secret sections of town. I learned that soft starts can work for children of any age, and I would say soft starts would even work in an adult work environment too, if adults could put down their cup of coffee and calm themselves for a few minutes before diving into work. I learned that I need to be more aware of the diversity in my classroom, and how I must choose works which speak to all the cultures and colors present there. I learned that “Teachers are magic, and magic is dangerous!” And I learned that spending my time, money, and effort to come to the national conference to present with my colleagues brings me closer to them in the shared expenditure of energy, and allows us to share some of the work we are doing at our high school with the rest of the teaching world. That was a day, wasn’t it?! Z did a pretty good job getting the global feel last night in her post– me I was pooped and went to bed. I woke up this morning thinking about our presentation yesterday, and Jimmy Santiago Bacca, and the awesome people we get to see and get to know here at NCTE. We did this session yesterday about our songwriting workshops, and I went to a great session on folk songs/protest songs, and we had a lot of conversations about authenticity. Being ourselves in the classroom (and the rest of our lives). One of the things that I find so magnetic about Bacca is that he is completely himself. There is no distance between the poet and the man. I drove him to the airport last year when he came to visit us, and we spent the ride talking about trucks (he was asking if I like my Tacoma- yes, of course I do), which sounds pretty mundane. At the same time he makes more casual literary references than just about anyone I’ve ever known. And I do know a few lit geeks. When he’s teaching he’s no different- he’s just being him. When I started teaching, like a lot of folks, I thought a lot of things about how I had to ‘be’ as a teacher. The short version is that most of it is bull. The part that isn’t bull is that I do have to know what I’m doing when it comes to literacy- other than that, the more me I am, the better I feel, the better kids respond, the better the whole thing works. That’s what we were getting at with the two prongs of authenticity idea. It isn’t enough to ask kids to do authentic things. You have to BE your authentic self. The songwriting stuff came to be because I got busy being my authentic self- and to be authentic I had to bring that self to work. I couldn’t really be someone else. And it’s the same for your students. We have to make classroom spaces where they can be themselves. They won’t do authentic work (no matter what the assignment), if they can’t be authentic people. If they can’t be who they are. Note- that doesn’t mean you have to tolerate disruptive or abusive behavior, but but you do have to be ready for honest conversations about school, your class, teaching, what your class is doing, whether they like it, whether it’s working (this is actually a really cool conversation to have), and sometime just some time to talk. There has to be room for choice and self creation in your class. For you AND the students. How are you going to be your authentic self in the classroom? And to put in another frame- if we are expected to differentiate for our students, then we have to differentiate for teachers. Also- holy hell St. Louis! What is up with Gooey Butter Cake!?!? That stuff will kill ya. I am in St. Louis. This local speciality is called “Gooey Butter Cake.” If you eat the whole thing, you die.